Since becoming a mom I have been focusing more on the products we are using in our home and on ourselves. 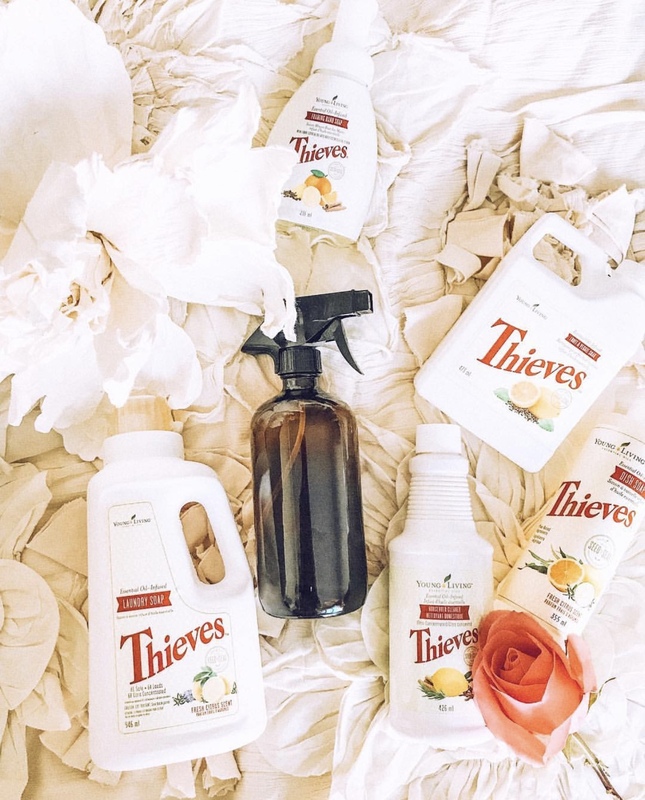 Natural cleaning products has been one of the things I have become the most passionate about and one of our absolute favourite non toxic line is the Thieves line by Young Living. 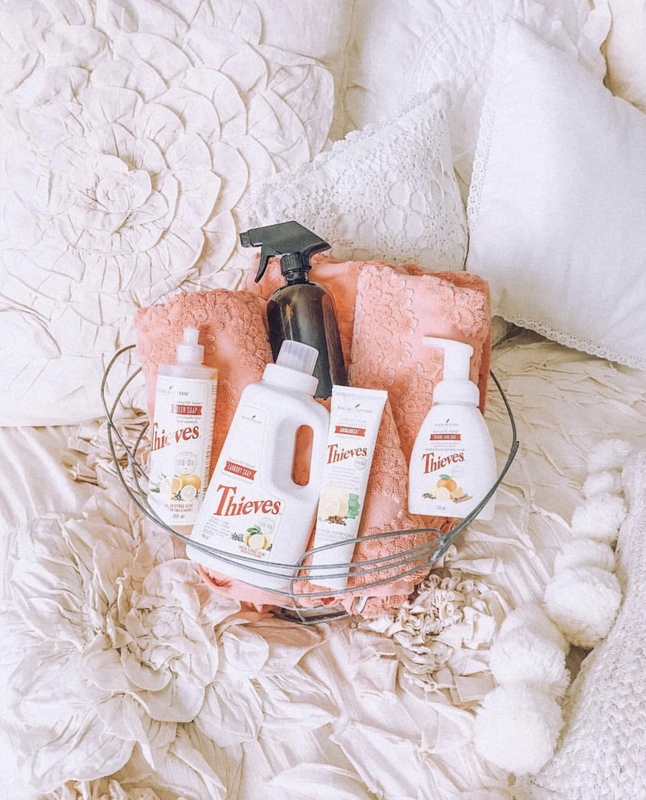 We swear by the all purpose cleaner, laundry detergent, veggies wash and the various other Thieves products offered by Young Living. I love that there is a safe, clean option for everything I need in my home. The all purpose cleaner is probably one of our favourites and its a concentrate so it works out to be really cheap based on how little you need to use. We mix one cap per spray bottle and fill the rest with water. Use it for absolutely everything in your home. Young Living offers amazing Premium Starter Kits that allow you to get your hands on a bunch of the products and get to know how amazing they are for way less. I highly encourage people who are just getting started to definitely start their non-toxic journey with the Thieves Premium Start Kit (and let’s get real I buy the kit as often as I can because it is SUCH a good deal). Here is an order guide to help get you started on this non-toxic journey. I’ve listed what is included in the Premium Starter Kits as well as some tips and tricks for some of the products below. By starting your journey with me, you’ll also get access to an amazing community and exclusive Facebook groups with unlimited resources and education on how to maximize your non-toxic journey with us. Have a berry stain on your daughters favourite white dress? Do not sweat. Boil a pot of water, add two tablespoons of white vinegar to it and stick the piece of clothing right in. It will come out within seconds. This trick works best if you do it immediately. We use it for everything and anything white or clothes that will not run. Set in stain? You can make your self a homemade stain remover or simply add some thieves laundry soap directly on the spot with some baking soda and white vinegar and set in direct sunlight. Then wash as you normally would. Tough soap scum and build up on toilets, showers and bathroom tiles: Use the all purpose cleaner, baking soda and some white vinegar and watch it come out with a gentle scrub. You can also add some lemon or jade lemon essential oil.